True motivational trainers with a call to action are hard to come by, and Darryl is one of the elite few. Darryl's skills have been honed over 20 years, and he is now a highly sought-after author, speaker, and trainer. He has found his passion in motivating employees and helping organizations improve their leadership & customer service. Darryl Ross is a graduate from James Madison University and began his career in the entertainment industry. As a lead dancer, singer, and emcee, Ross was hired by the Department of Defense to perform in U.S.O. shows for the military. Ross and his troop "King's Six", performed in South Korea, Okinawa, and Japan. It still remains one of the greatest thrills of his life. From there, Ross was cast in the musicals "A Chorus Line" and "Sophisticated Ladies" and performed for Royal Caribbean and Cunard Cruise Lines. Finally, he worked in the casino circuit as a featured performer in Lake Tahoe, Atlantic City, and Las Vegas. Representing entertainment in "Sin City", Darryl was featured on the E! Entertainment network and the Travel Channel. After leaving the stage, Darryl worked as the entertainment reporter for Fox 5 News in Las Vegas. He covered the red carpet for the Billboard Music Awards, Country Music Awards, and the MTV Video Music Awards. He also interviewed such stars as Celine Dion, Seal, Tim McGraw, Faith Hill, and music mogul Clive Davis. 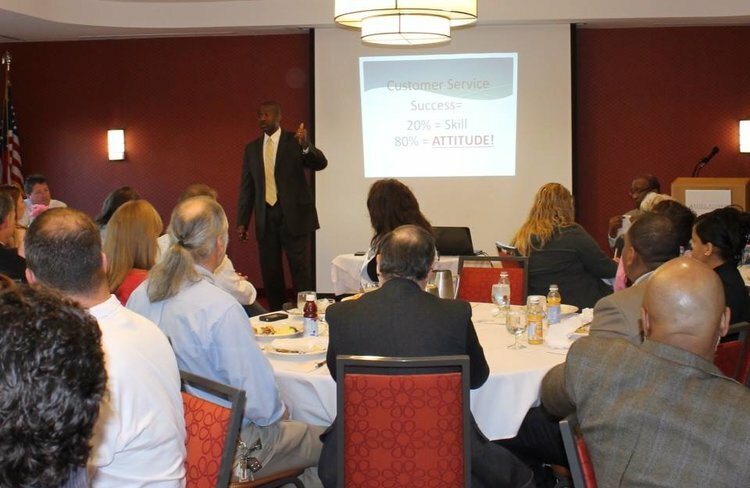 Through it all, Darryl knew he had a burning desire to be a professional speaker & trainer. He wanted to share his faith, knowledge, and experience to motivate people to live their dreams. For the past 15 years, Darryl Ross has provided keynotes, presentations, and trainings throughout the country....in addition, Darryl Ross' programs are certified by the Workforce Investment Board (WIB). In 2014, he was the Keynote Speaker for the Virginia Business Education Conference, the DCRA Management Expo, and the Loudoun Water Leadership Conference. He is also a 6-Time Century Sales Award Winner with $3.8 million in sales...in 12 months. We can choose to be mediocre, good, or Extraordinary! It all starts with our Attitude! Darryl Ross shares the roadmap to high achievement! Darryl Ross has given hundreds of presentations for groups of 10 people to 1000! From High Schools and Colleges, to Military Bases and Fortune 500 Companies. He is the author of the motivational book & CD “Be Extraordinary” and a contributing author to the book “Jumpstart your Success."